Briar Wilkes is a widowed single mother who, aside from trying to earn a living, is also trying to live up to her father's reputation as a legendary lawman while simultaneously trying to live down the criminal infamy of her late husband. The novel's focus shifts back and forth between Briar and her son Zeke. Her son desperately wants answers about his father and not getting them from his mother he sets out into the quarantined and rotter-filled part of the city in search of the truth—and so the story begins. To discover the truth about his father, Zeke will risk the mysterious blight, the voracious rotters and the perils of a world full of desperate survivors cut off from the civilized world. Briar wants to close the distance between herself and her son emotionally but before she can she must close the physical distance between them which spans a sky-high wall, blight, rotters and the mechanizations of the mysterious Dr. Minnericht. The characters and the story are very compelling and kept me reading with great anticipation up until the end. The novel is an easy read with solid(with the odd glitch) and fast paced writing. There's a little bit of course language. The rotters(zombie types) are kinda scary but they're relatively tame and more atmosphere than the focus which keeps the novel far-removed from the horror genre. A five star comic book adventure in novel form. 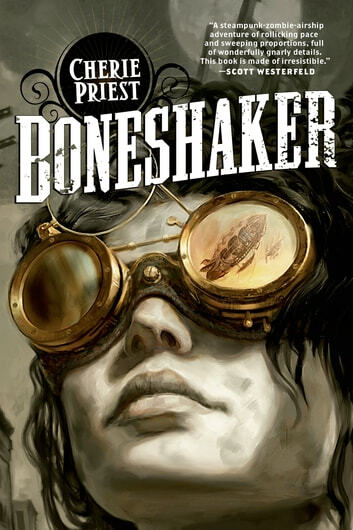 Boneshaker is very much a commercial novel and it reads like a suspenseful television show with a huge build up and then boom everything is resolved in the last five minutes. Instead of a boneshaker the ending was a bit of a head nodder. I get the ending but I really wish it resonated more. The inclusion of airships also seemed a bit contrived. All the right ingredients are there in the novel but somehow the taste fell a bit flat for me. Thoroughly enjoyable steampunk zombie adventure. Well-rounded characters and a rich setting.